My ongoing obsession with greeting cards, I am probably Hallmark’s™ favorite customer. This past Memorial Day weekend, I went on a little shopping excursion with a girl-friend of mine. I was helping her pick out children’s gifts for some friends (with kids) she is planning on visiting for her upcoming vacation, but then, I ended up doing a little shopping of my own. I was kind of, aimlessly wandering around the shop when I came across a rack of greeting cards. There were some really cute hand drawn cards by a local artist named Nidhi Chanani that I found, & I couldn’t resist picking up a few. I recognized this artist, as I recently bought & framed an art print by this very artist. 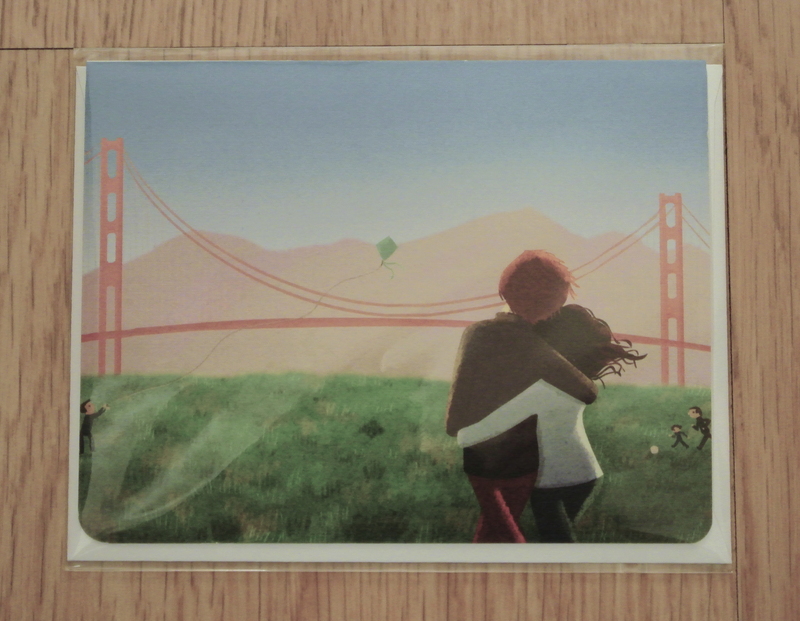 I love all of the San Francisco inspired artwork by this artist, & I love the light-hearted nature of all of the scenes being depicted in the artwork. 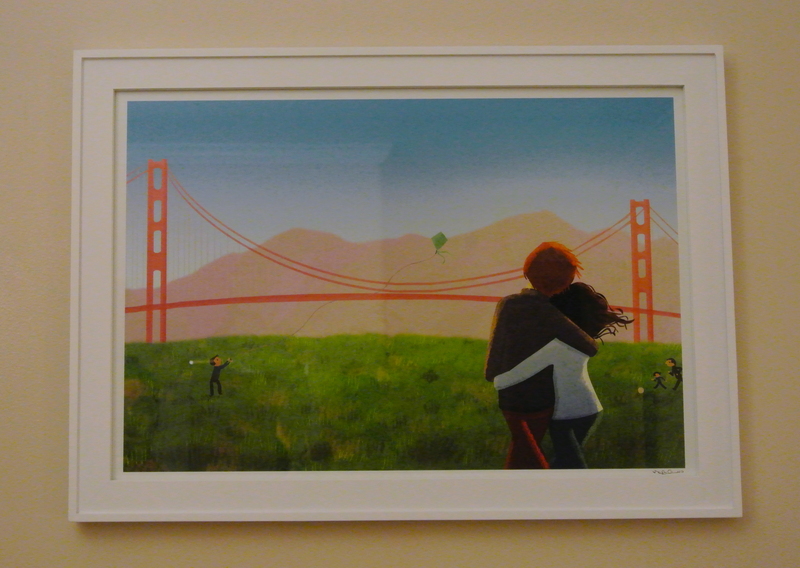 I love this art print of a couple embracing while gazing at the Golden Gate Bridge. 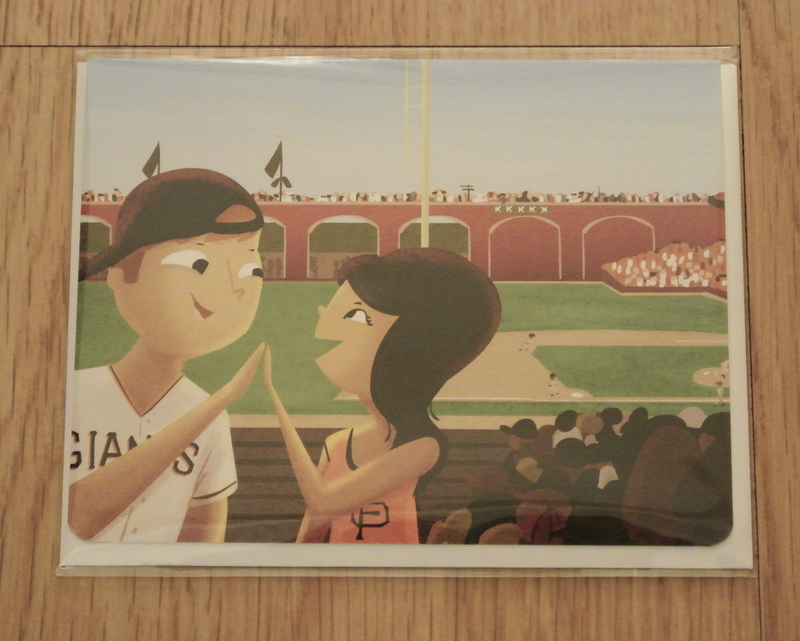 It’s such a romantic scene, & it’s the greeting card version of the very same art print I hung in my bedroom. I feel like the characters in this print could possibly resemble myself & my favorite person (Mr. H.). This is such a whimsical art print. I just love the relaxed, romantic feeling of this picnic moment in the park while blowing bubbles. This is one of my favorite art prints. I am a HUGE baseball fan, & the Giants are our local city’s baseball team. This also reminded me of my favorite person (Mr. H.) who is also a big-time Giants fan, & the characters in this print sort of look like us. This is the original Nidhi Chanani art print that I purchased & framed. It is now happily hung on the wall in my bedroom. I’d also like to THINK that the characters in this particular print also resembles myself & my favorite person (Mr. H.). Well, you know me. 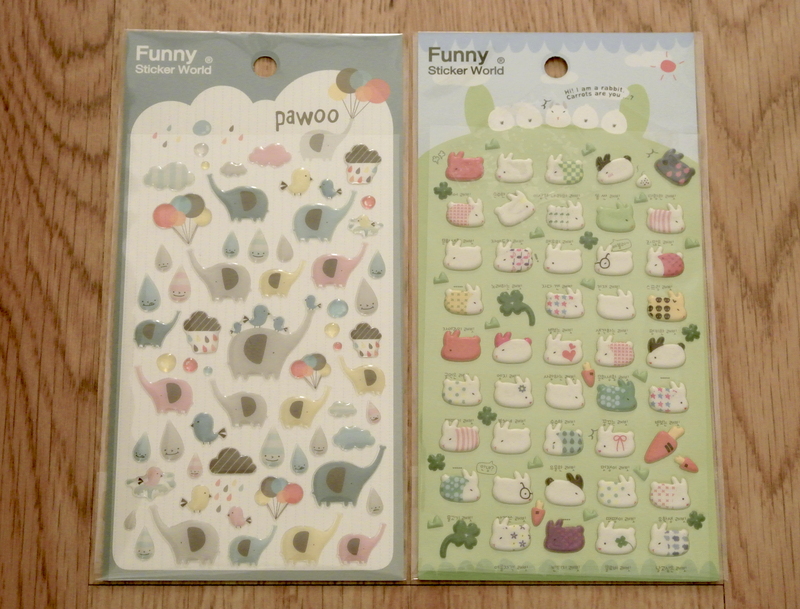 How could I resist these cute & adorable stickers? There were so many to choose from, but I restrained myself to only getting two. Eep those cards are so cute! 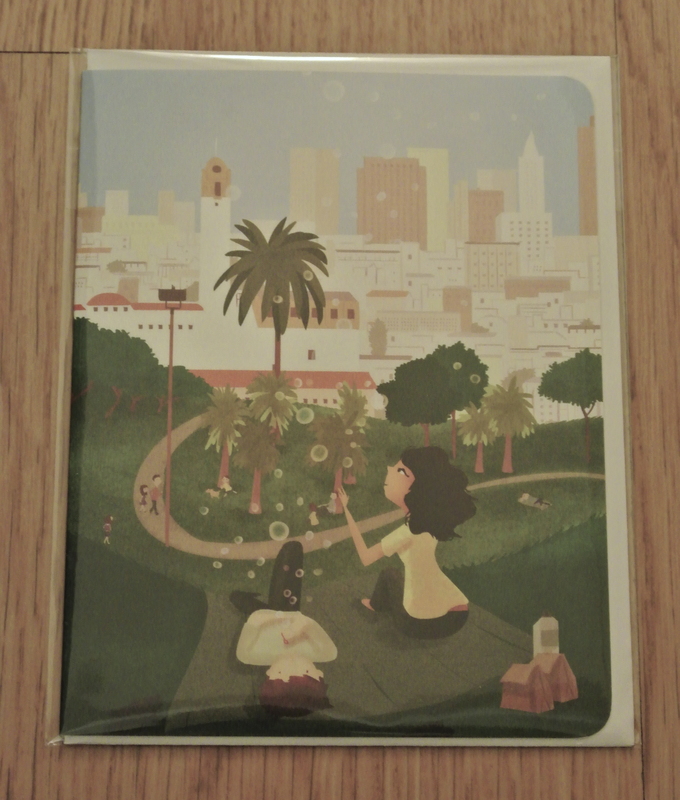 I wish we have those in Singapore, but it’s very rare to find Hallmark cards here. Hard to believe right? I always thought Hallmark was ubiquitous … or maybe my stationery sleuthing skills are really bad ( I highly doubt it). Hi @heyjayel! You can try this website: http://www.everydayloveart.com and ask them if they ship overseas to Singapore. Thanks for commenting! 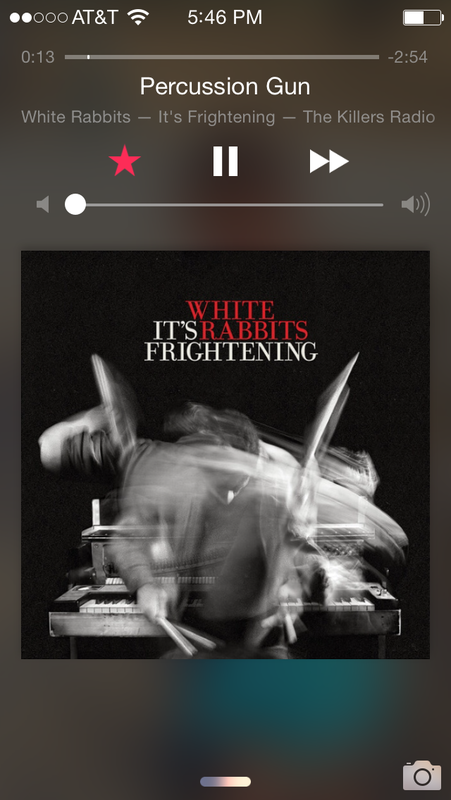 « My phone is covered in sheep!